There is no value add for your company sending you to a conference if you don’t implement and share what you’ve learned. Organize an informal meeting with your colleagues and managers and share important takeaways from the conference. 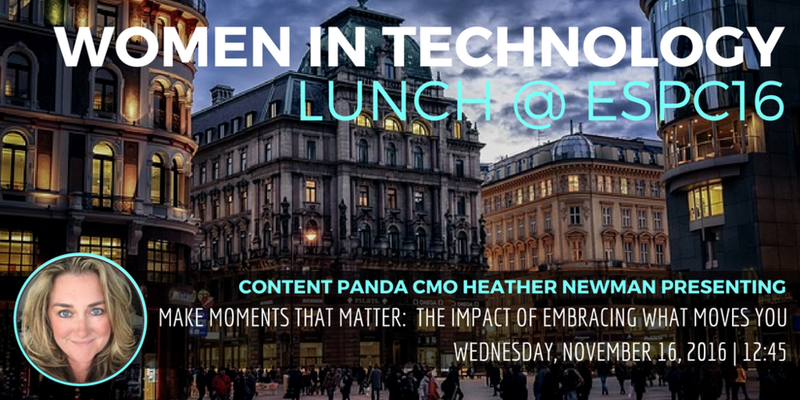 I was honored when the folks at ESPC invited me back again this year to headline the Women in Technology Lunch. Last year was an amazing experience. This year I will be presenting - Make Moments That Matter: The Impact of Embracing What Moves You where I'll shares stories about embracing moments that move you to inspire your work and your life. Still haven't made up your mind? Then visit 10 reasons to attend ESPC16 to see why you should be there. Then book your ticket today.